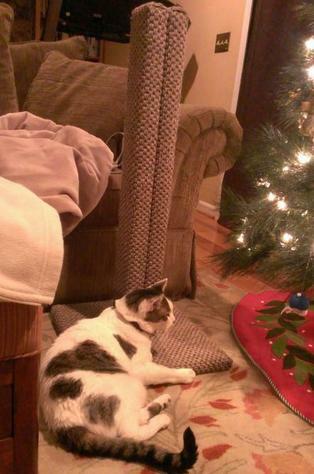 Higgins enjoying his new scratching post, the first one he has ever shown interest in, in 14 years! Old cat condo is new again! 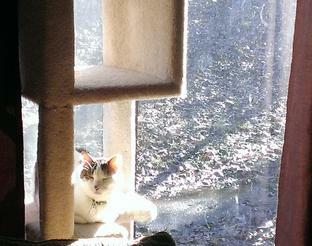 Sunning on his newly placed cat condo by the window it just needed new scenery to peek his interest! After mentioning our plight to someone, we got an enthusiastic recommendation to call Ingrid, so we set up the appointment. I must admit, part of me was expecting a bit of crazy-cat-lady-meets-pet-psychic-to-the-stars, but hey, it would be better than what we were working with, right? Ingrid showed up and was sane, funny, and armed with research, science, experience, and an integrated hypothesis on what was going on. She spent a ton of time looking at the situation, teasing out subtle details, and adjusting her approach as she went. In the end, she said it was likely that his single, small, cave litter box probably trapped him (in our laundry room) and got him scared when (possibly) our very loud washing machine went into a spin cycle. She suggested providing multiple, larger litter boxes after first finding a (possibly less perfumed) litter than we were using. Your results may vary, but one visit, one set of instructions, one (much less expensive than all the cleaning fluids and puppy pads) trip to the pet store to try new litters, and we have been back to normal starting the day Ingrid was here. Aside from solving the “problem”, Ingrid was also really tuned into Higgins’ happiness. We have moved his cat tower to a better place, have a dedicated scratching post that he actually uses now, and added a comfy vertical space to hang out in for the afternoon sun and birds. Our awesome cat is back -- he is visibly happier and more playful. We are thrilled, and had we known she existed, we would have called Ingrid on day 1 of the problem. Want a happier cat or to solve a problem based on fact and not internet noise? Call Ingrid. Now.